LEXIE CANNES STATE OF TRANS — The other shoe fell today. We knew it was coming, and by gosh, it came with a few surprises. Who knew education secretary Betsy DeVos would try to protect trans kids and stop the trans menance known as Attorney General Jeff Sessions? Sessions eventually got his way of course, and unless trans kids live in a blue state, they’ve now 4 years of misery ahead of them. One tactic for surviving Trumptude is to engage in activity to politically curtail the power of the Trump administration (and this includes vice-President Pence). Our first sure-fire shot is in 2018 when we can stop the bloodletting by taking over one of the congressional houses, and in 2020 by electing a president who will restore lost trans rights by executive order. With Washington state the major court challenger to Trump’s Muslim ban, Inslee found himself making appearances in national media. Hints began appearing suggesting he was seeking to run for president in 2020. Inslee has responded to them by saying he’s having fun what he’s doing now. Political insiders say Inslee didn’t seek national attention — the Muslim ban fell in his lap and he took ownership of the matter and got it resolved. This is the kind of event that open doors to national politics and Inslee proved his mettle in the handling of it. “I strongly oppose the Trump Administration’s reversal of federal protection for transgender students. Washington state will continue to be a place where all children can feel safe from discrimination, harassment or assault based on their gender identity. . .
Well, there you have it. Gov. 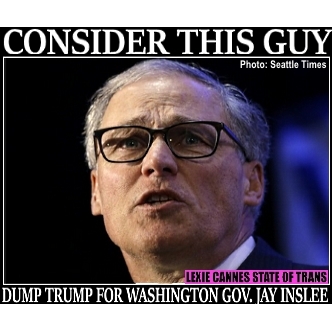 Inslee appears quite educated on trans matters. Maybe west coast-style governance is what this country needs. He should throw his hat in the ring for 2020. The future is looking brighter already. Sources: Seattle Times, Roll Call, The Stranger, Facebook and other online media.